Have you had a chance to download the JMP Graph Builder for iPad? If you haven't, go to the AppStore and download it. It's free and a great tool for data visualization and exploration, and it's the best way to view and explore JMP 10 data tables right on your iPad. In a previous post, blogger Michael Hecht talked about getting data to the iPad and described methods using iTunes, Mail and embedding a JMP data table on a Web page. 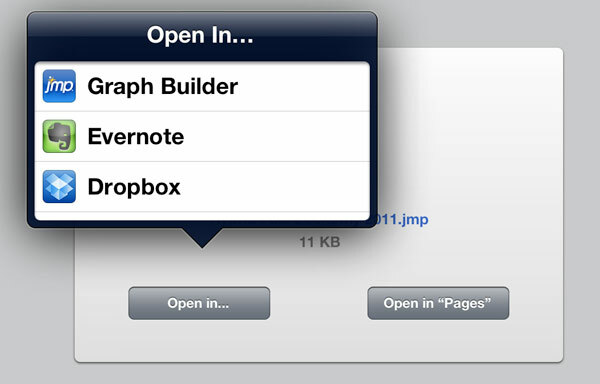 And now with the latest version of the JMP Graph Builder, Dropbox support is fully integrated. I have one other way of getting data to the iPad that even lets you share data with groups of people, or publicly, without needing your own website to host files: Google Docs. Google Docs provides an option for storing JMP tables online, controlling who has access to those data tables, and creating a convenient data catalog that is accessible from your iPad anytime you have access to the Internet. In Google Docs, there is a small drive icon with an up arrow on it. If you hover over that, you have the option to upload files. Now select the JMP data table that you'd like to upload. You will want to make sure that you uncheck that option to convert the file to Google Docs format. This will keep the .jmp file format intact. 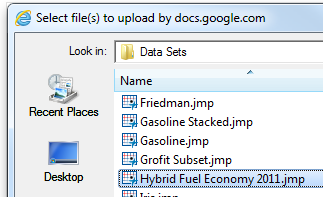 When the upload is complete, you will have your JMP file available in your Google Docs directory. If you navigate to the corresponding Google Docs mobile page on your iPad, you will be greeted with the file that you just uploaded on your desktop computer. To open this in the JMP Graph Builder app, simply click on the file name. The file will be recognized as being able to be opened in JMP Graph Builder automatically. And there we are! From desktop to iPad quickly and easily through Google Docs. Now the trick here is that you can take this one step further. 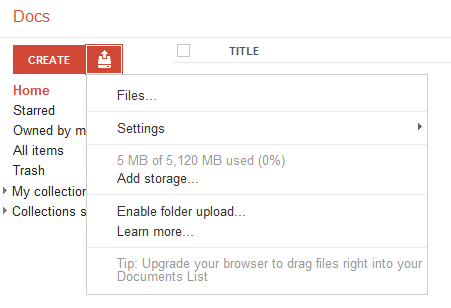 Google Docs offers the ability to change the permissions of any file uploaded. 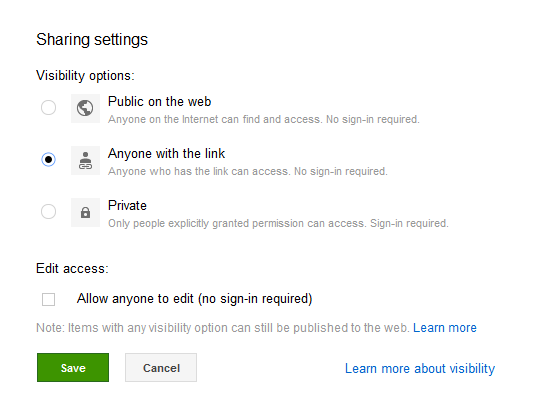 Normally, only you can see the files you've uploaded to your Google Docs account, but if you edit the sharing settings of any file, you have the option to share the file with anyone (anyone who can find and access the file), anyone who has a link to the file, or only specific people explicitly granted permission. This flexible permission structure, combined with the library-like nature of Google Docs, makes this way of getting data into Graph Builder on the iPad quite powerful. Generate a set of data visualization scripts in Graph Builder on desktop JMP, upload to Google Docs, and email each member of your team so they can explore the data visually on their iPads along with you at an upcoming meeting -- instead of staring at static screenshots or presentation slides. Create an online library of JMP data tables from all of your active projects. Easily access those files anytime you need them, without having to drag your laptop around. For educators: Upload a set of files once to your Google Docs account and then share links to all pertinent examples from the day's lecture with your students without the need to email attachments. Students can follow along visually as you explain concepts.